I totally, totally, totally loved seeing the Great Wall. I was supposed to go on the second of my three days in Beijing, but the train left without me. Actually, I just strolled up to the deserted North Beijing railway station at 11:30 and the conductress had to tell me, "You cannot." The train leaves daily at 8am sharp. All I could do was try to squeeze the Wall into the third day yet be back in Beijing to catch the overnight train to Shanghai at 7 p.m. Just so. I had the choice to go to the touristy part of the Wall at a place called Badaling, where they've completely artificially reconstructed the place and put up fluorescent banners and things, or to go to Simatai, a relatively untouched part where all you can see is mountains and this crazy crumbling wall. After a week in the crowded metropoli of China, the latter sounded lovely to me. The problem about Simatai is its distance from Beijing--3 hours away by minibus--which means leaving at 8 a.m. from the Jinghua Hostel and getting back, if all goes well, at 5:30. From there, I would have to return to my own hostel, collect my bags, then fight rush hour road and foot traffic to make it across the city to the train station by 7. The good advice of my hostel roommates, the Frenchwoman who'd missed her spot on the Trans-Mongolian train the day before, and the American who assured me I'd be back in time and that it was "hella worth it," convinced me to go anyway. So I went. On our way there, about seven of us from random countries sprawling in a creaky minibus, we have to detour on a small dirt road because of small fender bender in the way on the main highway. "Oh no, it's an omen," I think, then dismiss it because, well, I try not to believe in omens. I rationalize that, whether we are back an hour before or an hour after my train leaves Beijing station, there isn't much I can do to alter things. Hold onto that thought for a moment while we discuss The Wall. The thing is amazing. We pull up to a random lot in the middle of this mountainous place that looks nothing like China or any other country I've seen before. The lot, gauntleted by hawkers of souvenirs and a string of restaurants offering meals at half price for foreigners, is almost devoid of other tourists. It takes some 20 minutes to hike from there up a steep hill to The Wall itself. We pass the ubiquitous postcard vendor: "Hello, postcard? Where you from?" and his buddies, engrossed in a game of cards. Puffing, we arrive at the lowest tower, like an abandoned playhouse made of beige rock. From there, I just can't quite grasp what I see. This thing is massive. You look as far as you can and it's disappearing over the horizon, then you swing around and look as far as you can in the other direction and it's the last thing you see there, too. I brought home some dirt from one of the towers in an empty film canister, and incidentally, I happened to open it and smell it later. Don't ask me what possessed me to do that. It smelled a little like pee. Then I remembered how sometimes trekkers will try to camp out on the Wall. So, it's quite likely that it \was pee. But man, if I were a guy, I'd probably want to pee off The Great Wall too. I digress. We spent the best three hours of my life perhaps on The Wall. We leave at 2:30 and I think, this is great, we'll be home around 5:30 and I'll be golden. We run into the dirt detour and we slow, slow, slow, down and stop. My heart just drops into my socks. I look up ahead and see a line of cars winding around the bend past some farming houses. We sit there idling while I reassure myself that things will start moving at any moment. The driver ahead of us gets out of his truck. Our driver kills the engine. I just start praying. We sit in the dirt for one hour, and it fees like nine. I am praying the whole time. I start out with these polite prayers, like "Please clear the traffic", "Please get us to Beijing as quickly as possible," "Please keep us safe." After an hour it's really down to "Please, please, please just let me make the freaking train." At 3:30 we start moving again, and I keep praying. We pass signs with the distance to Beijing in kilometers and I figure it will take a little over 2 hours from where we are, which will still be fine. As we get closer and closer to Beijing, we run into more and more traffic, though we don't have to stop again. Fortunately most drivers in China ply the roads like madmen and women. I take comfort in the fact that our driver is doing everything in his power to execute every illegal pass on the right and to run as many red lights as possible. We are still so far out of the city that I can't find it anywhere on the dusty horizon. At about 5:00 we begin to see a few tall buildings, the ones built for the Olympics, and I think we are okay. An hour later, we are not okay. We are somewhere on the "Third Ring Road." The roads spiral out from the Forbidden City in the center of Beijing. I have to get from a point on "Third Ring Road" to somewhere near "First Ring Road," if there is one. On a dartboard, I'm barely on the rim aiming for Nineteen-Point-Triple-Play. At 6:30, the Italian guy with sleeping girlfriend asks me, "Hey, are you going to make your train?" At that moment I resign myself to failure. I will have to stay in a hostel somewhere and try to squeak back Friday night before my flight out on Saturday morning. I say, "I don't think so." I have given up hope. Suddenly the same guy says, "Look, the Jinghua!" He adds, like the most casual thing in the world, "Why don't you jump out here and get a taxi?" The street is packed so I convince the driver to let me out and run across a few lanes of traffic to hail a cab at the curb. I show the cabbie a map with my hostel, theoretically about 5 minutes away on an empty road. Traffic is like Delhi or Manila or Tokyo or any sardine city at rush hour. He idles in a turn lane and I have to try to communicate to him that I am in a hurry. Except "Thank you," "How much is this?" and "Tha's too expensive, I don't want it," I can't speak Chinese. Instead, I do it by shaking the passenger seat and saying, "I want to go fastfastfast!" He gets the idea. My legs are trembling the way they haven't done since my piano recital in 3rd grade. The cabbie begins to drive like a truly, truly mad madman, flashing his lights at everyone and driving mostly on the line down the center of the road, which in my state is extremely satisfying. We get to my hostel at 6:40 and I tell the nice man that I am just going to go inside and pick up my luggage, then I'll be right back. He has no idea what I am saying. I try it once more, telling him to wait in English and Japanese, as if that would do the trick, but no luck. It runs through my mind that I've been given advice on what to do if you want a taxi driver to wait for you. So I turn and run inside without paying. I already know the desk clerk speaks minimal English so I just hand him my bag tickets and sprint along to the cloakroom to encourage him to do the same. He takes a long time to get the little elastic bands with the luggage tags off my bags and I grow impatient so I just riiiiip the darn things out of his hands and sprint back across the lobby throwing "Xiexie" (thank you) over my shoulder. Outside the taxi driver is pacing in front of the cab and I jump in and we realize we have no idea where we are going because "metro" is not "metro" in Chinese the same way it is in Japanese. I see everything going down the drain, but I inhale and play a frenzied game of charades in which I pretend to be descending stairs and then make the sound effect and gesture of subway doors opening (shooOOONK). Miraculously, it works. We are off. Another traveler at my hostel, sitting on the front porch, has seen the whole thing. I don't care. We make it to the metro entrance and I sprint inside. It is 6:43 and I have 2 minutes until the subway arrives, which I know takes 7 minutes to get to the stop in front of the train station. I take a minute to gather my thoughts and realize I have not eaten since lunch the day before, so I buy the only thing I can recognize, a bottle of Coke. I take one sip, realize my hands are shaking, and decide the last thing I need now is a dose of caffeine, so I put it in my bag. I take the next minute to prep myself because when I get to my next stop, I am going to have to sprint across the platform, up the stairs to street level, across the typically massive square in front of Beijing station, through baggage check, through the waiting area, over the platform, to my train. This must happen in 8 minutes, starting from 6:52, when I will arrive at the station and see the metro doors open (shooOOONK). The subway arrives. (shooOOONK.) Here we go. Seven minutes later the doors open and I go running, across the platform, up the stairs, through the square, to baggage check give my bag, wait - wait - wait grab my bag, sprint through the station, into the waiting area, it's very crowded, I can't slow down, I have to get to the other end of long rows of chairs, I run down a row, there are two men talking, I motion to them to get out of the way, they don't bother, I can't stop, I run between them, one of them has defiantly taken a step forward and as I bowl straight through I see him go flying out of the corner of my eye and I would like to say "I tried to warn you, didn't I" but it is too late, I am at the ticket taker, I give her my ticket, run to the platform, everyone is on the train, I see a clock, it is 6:56, I begin to breathe, I look at my ticket and I am in car number two. I look at the car in front of me. It is car number eighteen. I go to the woman at car number eighteen and ask to get on. She says, "You cannot." Customer service people seem to like to say, "You cannot." I sprint sixteen cars to car number two. 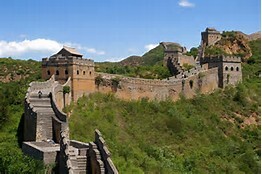 Finally on the train, sweaty, carrying my bags and an "I Climbed the Great Wall" t-shirt, I make my way to my seat as the train starts moving. I put my bag on my seat and look at the three seatmates who are, for the next fourteen hours, my new friends. They are all staring, with big dish-plate eyes, at me. A thought crosses my mind and I turn to look at the people behind me, a cluster of six who are, in these close quarters, also my friends. Their eyes are even bigger. I wipe some sweat off my forehead and do the only thing I really can, which is say, "Hi." One girl raises her hand slowly and whispers, "Hi." They keep staring. 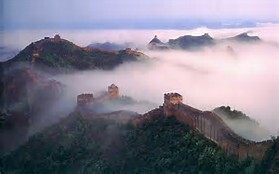 I sit down in the seat as the train pulls away from the station and think that three hours ago I was hiking quietly in the windy boondocks on the truly Great Wall. I think about how I've had only a sip of Coke in the past 32 hours, how I have sweat running down the legs of my jeans, how I will not be able to shower or change until I have passed two days in them. How I am absolutely happy as a clam to be on this train.